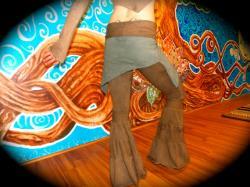 These are the tantric flow yoga dance pants. A relaxing fit with style and comfort. Wear these pants for a formal or casual date. I cut, sew, and dye these pieces from start to finish. Each garment is made by hand, and dyed by hand and sometimes that will show in the variation of garments. Sometimes dyes will turn out a slightly different shade than expected, sometimes they will turn out a bit tie dyed. When you are dyeing with herbs, insects, and other natural vegetable and plant dyes, the outcome can vary slightly. :herbal dye and organic fabric care. We ask that you take good care of your garments from us especially while washing, please machine wash on cold, and air or hang to dry. Herb dyes can sometimes be sensitive to sunlight, so please dry them in the house, rather than outside. Other certain herb dyes are sensitive to citric acid found commonly in tomatoes and other citrus fruits. If you splash some of this on your clothes, wipe with a cool rag right away to lift the acid out. It may stay, but usually fades over a little bit of time. Measurements i will need for a custom. The custom turn around is 4 week from start of order to the day they arrive at your door. Much love and blessing to all.